You may know about the #supportthescene movement or you may not. 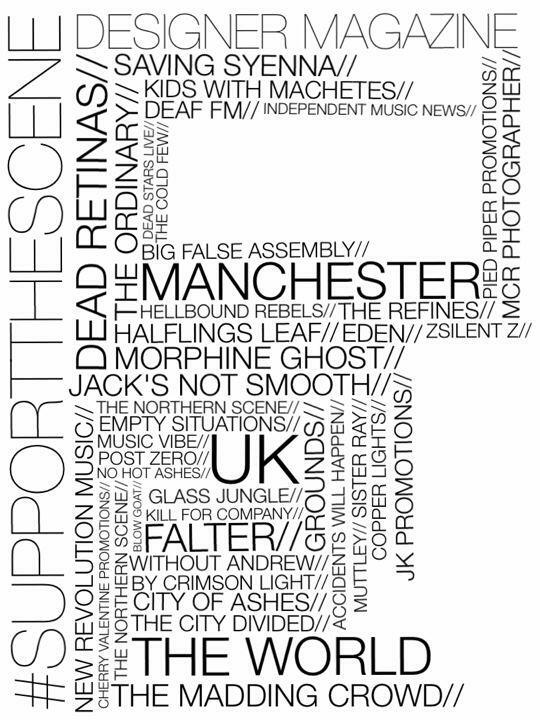 Begun by Designer Magazine in Manchester as a way of persuading bands and fans to stay behind and watch others after they’ve played, it’s snowballed into a Manchester based music philosophy which is even having a film made about it (click here). - Humans are social creatures. We like interaction and we like feeling like part of a group; in a pack you can catch a much bigger animal for dinner than alone. A lot of bands think hard about their image and the message they’re trying to convey. It seems a shame for an audience member to let that opportunity to feel involved with that band go to waste. Think of all the interviews online that people like to watch of bands. You can talk to bands in real life if you just go and see them, and they’re probably more interesting and down to earth and unique than the kind of band who gets on Xfm. Given the chance to take part in a movement or a scene created around a band, why not indulge in it fully? Take everything they’re offering you - flyers, CDs, t shirts etc. Rather than eating chocolate, taking drugs or watching the X-Factor, immersing yourself in the glow of a truly interesting band would be intrinsically beneficial to yourself and the music scene. Of course this has to work two ways. A member of the public can’t be expected to actively seek out information about a band or have to ask them for something to remind them of their performance. The act of being in a band is much more than just writing and playing songs - you’re selling yourself as much as your music and so why not promote that as much as possible? I think that’s what #supportthescene is about. There’s nothing altruistic or selfless about paying to go and see a band anymore than there is about going to rent a DVD. Supporting the scene should be purely about an exchange of emotions and ideas on a grass roots level, with real people singing real songs. Just something I was thinking anyway.